This website is optimized for viewing with a screen resolution of 1280*1024 pixels, browser window in full screen mode. Lower resolutions or a reduced browser window might result in an improper display. If you are using Internet Explorer 5.5 or 6, Java must be enabled for the pages to be displayed properly! This website is an unofficial, private tribute to Magnetic Scrolls and their games and is in no way affiliated with Magnetic Scrolls or any of its former distributors. and educational purposes only. Any commercial use of any of the content on these pages is not intended. The only reason for making the material available here is to prevent the loss of the games. "The Pawn", "The Guild of Thieves", "Jinxter", "Corruption", Fish! ", "Myth", "Wonderland" and "The Magnetic Scrolls Collection" © Magnetic Scrolls Ltd. 1985, 1987, 1988, 1989, 1990, 1991. "The Legacy" © Microprose Ltd. 1992. The Magnetic Scrolls copyright has been associated with: Rainbird Software, British Telecomsoft, Virgin Mastertronic and Microprose Ld. Currently the copyrights reside with Magnetic Scrolls Ltd. (Ken Gordon and Anita Sinclair). 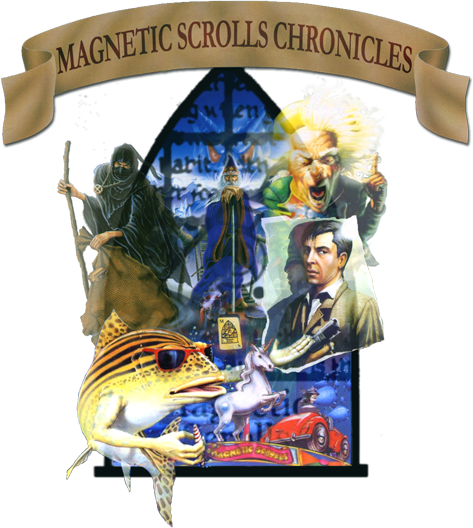 "The Magnetic Scrolls Chronicles" website is owned by Peter Verdi. The content of this site may not be used in any way without the permission of the webmaster. "The Magnetic Scrolls Chronicles" website © 2000 - 2011 by Peter Verdi.